3 day Watercolor Workshop held in Hispanic Arts Building of EXPO-NM, Albuquerque, NM, from Friday, April 12th to Sunday, April 14th. Public DEMO - April 1th at 10AM-Hispanic Arts. Enter Gate #3 at San Pedro and Copper NE. Drive one block east, turning left on Main Street. Parking available in front and to the south of the Hispanic Arts Building. REGISTRATION FOR MEMBERS OPENS November 1, 2017. Deposit of $100 is due at the time of Registration. Total Workshop cost is $235, with full payment due at the time of Registration. Ming Franz is widely recognized for her "splash" painting, which combines primary watercolor with Chinese ink and brush. In recent years she has experimented with acrylics on watercolor paper and panels; developing her award-winning skills. Now she is devoting her time, almost exclusively, to creating colorful abstract paintings which are garnering much attention. Among the many awards she has received is the esteemed Grand Prize in the International Artist magazine’s challenge in Abstract /Experimental Art. A highly-regarded instructor, Ming teaches workshops and conducts demonstrations at the New Mexico Art League, University New Mexico Extension Course as well as in her studio in Edgewood, New Mexico. Along with her teaching, both in groups and privately, her popular book “Splash Ink with Watercolor” continues to inspire many artists. 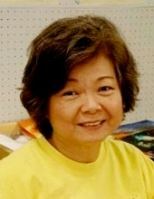 Her teaching has brought her to venues such as the Artist’s Expo, Houston, Texas, Wichita, Kansas, Chicago, Illinois, and Silicon Valley Asian Art Center, California. Denver Art Museum, Colorado, Artist's Materials Expo, Santa Fe, New Mexico, and the World of Color Expo, Herndon, Virginia. Ming's art has been featured in numerous publications including Acrylic Artist Magazine, Acrylic Illumination, American Art Collector, International Artist Magazine, Southwest Art Magazine, North Light book series, Artist’s Magazine, Studio Visit Magazine, Kennedy Publishing Magazine, Albuquerque Journal, Mountain Valley Telegraph newspaper, San Jose Mercury, Asian World Journal in the US and Rainbow Magazine in Taiwan and International Artist Magazine. WORKSHOP SUPPLIES: Workshop materials are free of charge, compliments of Golden paint, Yasumoto Co. and Oriental Art Supply.